EB Curing Outlook — Energy Sciences, Inc.
For decades, electron beam (EB) curable inks and coatings have been used in many different packaging operations and applications. 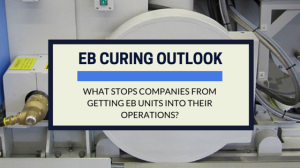 While the EB process is great for efficiency, cost, and the look of the final product, certain factors have impeded companies from integrating EB units into their operations. It used to be that the initial startup and capital costs were too much for businesses to consider switching to electron beam units and technology. Over the past decade, however, that has changed and the systems are affordable, with short payback durations. Also, the technology limitations aren’t what they used to be. Multicolor printing jobs can be accomplished on smaller EB units like never before. Also, the new chemistry allows for more printing applications where food safety and regulations were an issue in the past. Another aspect is the fact that the reliability and effectiveness of eBeam curing has dramatically improved. Manufacturers and printers are now buying and using EB technology with renewed confidence. And the results can be tracked and monitored in real time. More floor space, year over year cost reductions, a safer work environment, and no VOCs all contribute to the rising popularity of an EB curing platform. The future looks even brighter, as food packaging and flexible packaging are both being dramatically improved thanks to electron beam curing.